Canada advanced to the semifinal of the women's world hockey championship with a 5-0 win over Germany on Thursday. Blayre Turnbull scored a pair of goals for Canada in a quarter-final victory at Metro Areena. 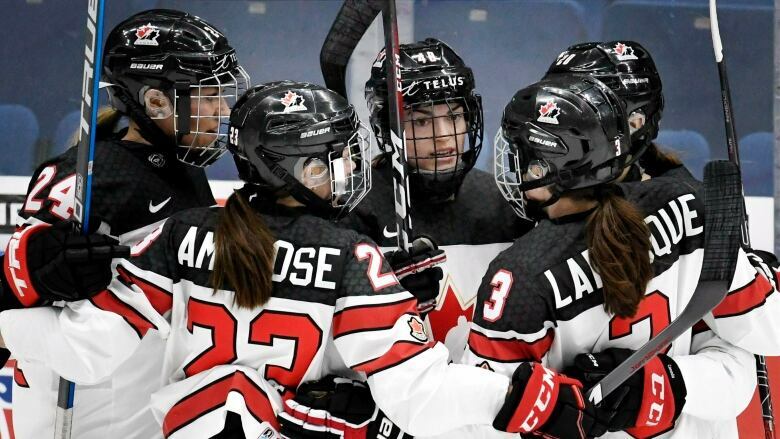 In an unfamiliar game against an unfamiliar foe, Canada summoned the brand of hockey the team believes can win gold at the women's world championship. Blayre Turnbull's two goals in a 5-0 quarter-final win over Germany on Thursday were scored by driving hard to the net and paying a physical price in front of it for a deflection. Canada takes on host Finland and defending champion United States meets Russia in Saturday's semifinals. The winners play for gold and the losers for bronze Sunday. Facing Germany for the first time in over a decade and playing a quarter-final for the first time, the Canadians generated offence in the second and third periods battling below the faceoff circles. "We're starting to learn what we really are," Canadian head coach Perry Pearn said. "We're not an offensive juggernaut in terms of scoring goals. "We are a really hard-nosed, blue-collar team that's tough to play against. We grind teams down over time and that's the kind of game we have to play." Brianne Jenner contributed a goal and an assist for Canada with Natalie Spooner and Laura Stacey also scoring goals. Defender Brigette Lacquette had a pair of assists in front of an announced crowd of 744 at Metro Areena. Emerance Maschmeyer had nine saves for the shutout in her second start of the tournament. The Canadians gave Jennifer Harss a workout as the German goaltender repelled 61 shots. That equalled the number of saves Viona Harrer made in Canada's 8-0 win over Germany the last time the two countries met in 2007 at the world championship in Winnipeg. "When you play against Canada, you expect a lot of shots," Harss said. "Against them, it's just super-hard. We gave it our all. I think five-nothing is not too bad." Byes to the semifinals for the top two countries in Group A and quarter-finals for the tournament's second to sixth seeds were introduced to the championship format in 2011. Canada and the U.S. earned the byes every tournament, but expanding the field to 10 countries in 2019 has eliminated that advantage. So the Canadians and Americans got reacquainted with opponents they hadn't seen in years Thursday. In their first game against Japan since 2009, the U.S. prevailed 4-0. Finland downed the Czech Republic 3-1 and Russia blanked Switzerland 3-0 in Thursday's other quarter-finals. Germany has yet to score on Canada in six meetings. The Germans spent the majority of Thursday's game defending in their own zone. The Germans were effective in the first period when Canada outshot them 18-5, but led by a single goal. The Canadians started wearing down the Germans in the second period with a 29-3 margin in shots. "Any elimination game is tough because you know the other team is giving it everything they have to stay alive, just like we were," Turnbull said. "It turns up a notch when you get into the quarter-finals and of course, semifinals and the gold-medal game." Spooner collected her fifth goal of the tournament to draw even with Kendall Coyne Schofield of the U.S. for the tournament lead. The Toronto forward muscled her way in front of Harss and tipped in a Lacquette blast from the point. "That's certainly our game plan, having a shot mentality and getting people in front of the goalie," said Jenner, who is wearing the captain's 'C' in the absence of injured Marie-Philip Poulin. "At every level, that's how goals are scored. You watch highlights from NHL playoffs last night and it's a lot of the same stuff." Canada scored three power-play goals on four chances. A pair of Canadian goals were waived off by officials — one for a goal-crease infraction and the other because the puck was directed by a skate. "Germany sat back, defended, defended, defended, so it's hard to get transition chances," Pearn observed. "Everything you create, you have to create in the offensive zone or on special teams. I thought the way we played after the first period was good. "Certainly we had lots of shots with traffic and that's what you have to do." Sweden edged France 3-2 for ninth place. Both countries were relegated to the Division 1 women's championship in 2020.